Bennett – 15 months (11 adjusted), is in glasses due to vision issues related to ROP from his early arrival at 23 weeks gestation. He was born so early that his eyes were still fused shut. 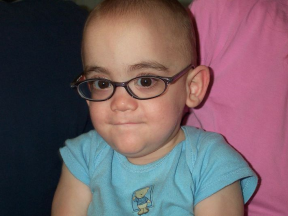 He began wearing glasses the at 11 month adjusted/15 months. Bennett – 15 months (11 adjusted), is in glasses due to vision issues related to ROP from his early arrival at 23 weeks gestation. He was born so early that his eyes were still fused shut. He began wearing glasses the at 11 month adjusted/15 months. He HATED them and has broken over 30 pairs of frames and chewed on his lenses. At 3 years old he now loves his glasses and sunglasses (he has light sensitivity) and only breaks them on accident.